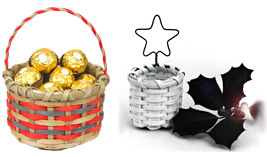 Chose from the categories below and make your own beautiful baskets with our kits. Each kit includes an illustrated step-by-step Instruction Booklet and great quality materials. Kits are an excellent way to learn to make baskets and these kits are available only from GH Productions Inc. -- The Basket Makers Catalog. Try them all and learn the basic techniques of basket making! Save even more with our Special Quantity Prices. Quantities include enough supplies for 5 or more of the same basket plus one pattern. Have a basket party and invite your friends. That's right, make your own 13" x 10" x 9" footstool from our kits. The kits are easy-to-assemble and recommended for beginners. Each kit contains a wooden frame, a great Instruction Booklet and first quality weaving materials - choose from a Shaker Tape Seat or a Flat Reed Seat. Frame also available separately. Imagine Your Tree covered with dozens of delightful Ornament and Holiday Baskets. These baskets, that you and your family made, are sure to find a place in your home for years to come.